Check out these Giant 75" Pool Floating Toys for $32.99 (Retail $59.99). What makes for a better summer than warm temps, sunshine, and lounging by the pool? 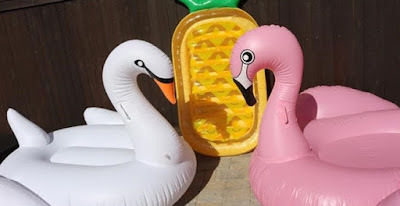 How about a giant swan, Flamingo or Pineapple ? Yes, you heard me. Ever since Taylor Swift and Calvin Harris shared a photo of themselves swimming with a giant inflatable swan, everyone wants to float in fashion. Come on, you know you want to, too.. Plus, it makes for the perfect way to catch some rays, read your favorite book, and sip on a cold beverage, Famous worldwide. Huge 75" Size Big enough for two. Perfect for play or lounging. Looks great in the pool.The perfect relaxation spot or decoration.Several would give you a flock of happy pool guests. Use the wings or tail feathers as an ideal headrest.